The Mott Bears have made basketball history, and Mott Community College is inviting the entire community to a public celebration in honor of the champions. 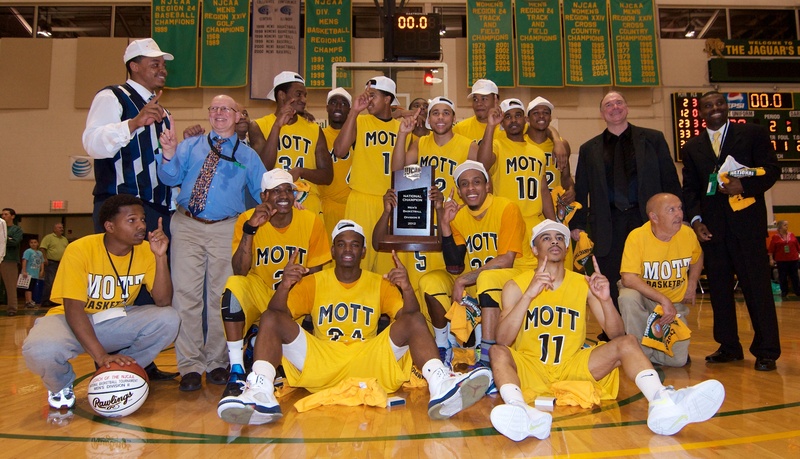 On Saturday, March 25, 2012, the Mott Community College Men’s Basketball Team clinched a record fourth national title at the National Junior College Athletic Association Division II (NJCAA) Men’s Basketball Championship. MCC now holds more national championships than any other NJCAA Division II men’s basketball program. MCC’s National Championship Community Celebration is scheduled for 5:30 to 7 pm, Wednesday, April 4, 2012 at Ballenger Field House on the main campus of Mott Community College, 1401 East Court St. in Flint. This event is free and open to the public. Refreshments will be provided. Free commemorative national championship posters will be available. Championship T-shirts and hats will be available for purchase or to order. In addition, coaches and members of the team will be on hand to greet fans. 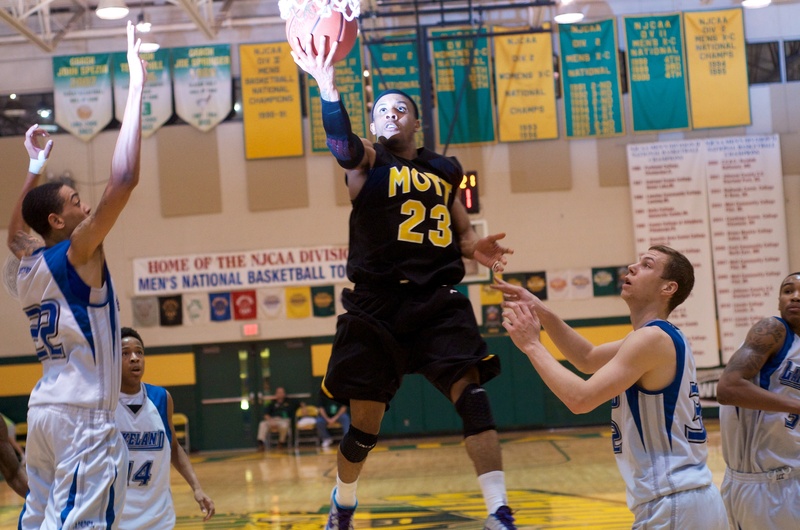 Mott sophomore Darryl "Boo" Marshall led the NJCAA Division II National Tournament in assist-to-turnover ratio. Marshall, Mott's starting point guard, turned the ball over twice in four games en route to being selected to the all-tournament team. Mott Community College sophomores Darryl “Boo” Marshall and Walter Davis led the national tournament in assist-to-turnover ratio and blocked shots, respectively. Marshall averaged 30 minutes per game and surrendered only two turnovers in four games for an astounding 6-to-1 ratio. Davis, for his part, spearheaded Mott’s defensive attack with 16 blocks in four games. In those games, Mott held opponents to a lackluster 38 percent shooting thanks, in part, to Davis’ ability to protect the rim. Marshall and Davis are two of three players Steve Schmidt recruited out of Memphis, Tennessee two years ago. DANVILLE, Michigan — Mott head coach Steve Schmidt, drenched from head to toe after an all-too-familiar post-national-title Gatorade baptism Saturday night, told a room full of newly-crowned champions how much he loved them. “This has probably been the most enjoyable season in my coaching career,” Schmidt said, just minutes after winning his fourth National Coach of the Year award. This iteration of Mott basketball is special; the others, well they were special too; but, what connects every player who has ever been coached by Schmidt is an unquenchable thirst for championships — and that comes directly from the hall of fame coach. At this level, no player outside of Mott ever has. Mott now holds the division II junior college record for national championships (4) and national tournament victories (27). Only two other programs at any level of JUCO basketball have won four national titles. Mott capped of an unbelievable 35-1 season with a 70-60 victory of Community College of Rhode Island Saturday night. The Bears won 35 games after replacing all five starters from last season. Led by a trio of all-tournament performers (John Taylor, Ralph Eason and Darryl Marshall), Mott took a six-point advantage to the locker room. Mott started the second half on a 7-1 run and put Rhode Island’s star Desmond Williams on the bench with dehydration. With Williams out of the game, Mott extended its lead to 13 points and coasted to the 70-60 victory. Once again, the dynamic duo of Ralph Eason and national tournament MVP John Taylor led Mott in nearly every category. Taylor scored 23 points with six assists. Eason added 22 points, six rebounds, five assists and three steals. As a program under Schmidt’s direction, Mott has gone to the national tournament eight out of the last 12 seasons. In those visits to Danville, Mott has never missed out on the final four. They have finished third once, runner-up three times and champions four times. — Ralph Eason capped off an unbelievable tournament run with style against Rhode Island. Eason had three dunks in transition to get the overwhelmingly Mott crowd on its feet. He also did the heavy lifting against Williams, whose older brother plays for the New Jersey Nets. He’s a serious player, but he ran into a serious defender in Eason. His numbers during this tournament are just sinful. Eason averaged 21 points, six rebounds, four assists and four steals per game. He shot a staggering 68 percent from the floor. — John Taylor finished the tournament with an average of 29 points per game. I’d be surprised if he didn’t become Schmidt’s fourth National Player of the Year (Jay Youngblood, Kevin Tiggs and Jeremie Simmons). When he graduates from Mott, he’ll have a number of opportunities to play at the next level. — Mott’s sophomore point guard Darryl “Boo” Marshall was on his job the entire tournament. Boo had a grand total of two turnovers in four games and averaged nearly 30 minutes of floor time. Don’t be surprised if he played his way into a D-1 scholarship. — Mott’s sophomore forward Walter Davis deserves a ton of credit for a season in which Mott depended on him too do the bulk of the work in the paint. At barely 6-4, Davis boxed well above his weight throughout the season; he stayed healthy and became a major difference-maker on the defensive end. After heart-breaking losses in the state semifinals in back-to-back seasons, it was Williams’ focus on the journey rather than individual outcome of playoff games that kept his Bucs resilient. This year, they completed that journey, dominating Traverse City St. Francis to capture the school’s first basketball state championship since 1987. Two seasons ago, Williams led a young Beecher team that lost two of its best returning players (Javontae Hawkins and T’aron Boose) to transfers, started the season 0-5 and many didn’t expect much out of the allegedly rebuilding squad. Beecher improved over the season, made up for their size and experience deficiencies by playing exceedingly hard and overachieved their way all the way to the state semis. In those semis, reality set in as Beecher was blown out by a talented and playoff-tested Melvindale team that featured a Mr. Basketball candidate (Michael Talley III) and went on to win the state title. Just part of the journey — Beecher’s young guards could certainly learn from what Talley was able to do to them and the intensity level the entire team would need to play at to compete that deep in the playoffs. Last year, Beecher returned nearly its entire roster from the previous season and spent most of the season ranked No. 2 in Class C. Monte Morris was the Class C Player of the Year and Beecher established itself as one of the best teams in the state regardless of class. Once again, they returned to the semifinals and they held a late lead in their game against McBain, a team that didn’t have as much speed or talent as the Bucs. This time, the Bucs were the experienced team featuring the highly rated player, but unfortunately, the result didn’t change from the previous season. Late mistakes allowed McBain to pull off the improbable upset and send Beecher home despite being the clear favorite of the remaining four teams in Class C that season. As Brendan Loy of The Mid Majority says, ‘This Game Will Hurt You.’ The journey strikes again. But this year? The journey paid off. 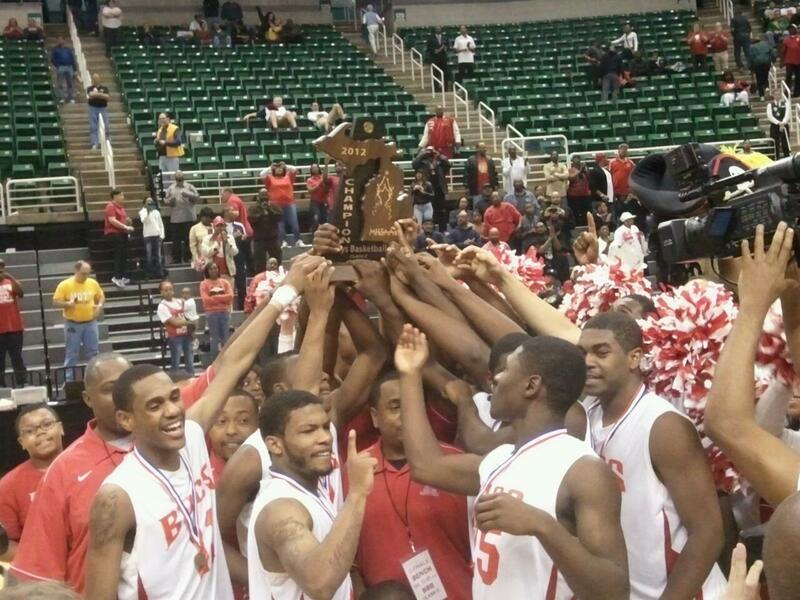 Beecher learned how heart-breaking losing can be, so they just didn’t lose, finishing the season 28-0. Simple enough. On the court, Beecher did everything it was supposed to do this season. In the final game, Monte Morris was the do-everything force. Antuan Burks was the ball-hawking defensive terror he’s been known for being and helped shoulder the scoring load. Cortez Robinson got his long arms in passing lanes, defended much bigger players well and moved without the ball on offense, catching passes from Beecher’s pass-happy guards. Jequarius French bullied his way for rebounds and layups under the basket. Beecher’s press created the turnovers and easy scoring opportunities it always does, and Beecher’s depth kept a ready supply of fresh, fast, skilled athletes on the floor at all times. It’s impossible not to admire how the Beecher program is run (and actually, that starts at the top of their athletics program with Athletic Director Courtney Hawkins). Today was a culmination of years of work that Williams and his team have put in to accomplish this championship. But what I’ve always admired more is that, although Williams undoubtedly wants to win as much as anyone, he never loses sight of the bigger picture, of the more important lessons that he has a chance to use sports to convey to his kids. Win or lose, he always understands the moment and he understands how to teach his kids to productively channel their emotions. To me, he’s simply the best high school basketball coach in Michigan. He didn’t need the championship today to validate that, but hopefully it helps him start to get the recognition he deserves for what he and his kids have built at Beecher. Mott freshman Ralph Eason poured in 26 points with seven steals against Lakeland in the national semifinals in Danville. DANVILLE, Illinois — At some point, conventional wisdom directed, the Bears’ lack of size on the frontline would catch up with them. The antagonists have been waiting for it and, for now, they’ll keep waiting. Mott (34-1) took down a much bigger Lakeland squad in the national semifinals tonight in Danville, 84-73. As much as Lakeland’s team is all about quality big men, Mott’s attack is led by a stable of tireless guards that make life miserable for the opposition. The Bears lost the rebounding battle, but it was close; they lost the battle of points in the paint, but it was close; they won the battle of the backcourt, and that wasn’t even a contest. The lead horse, sophomore John Taylor, scored 28 points to earn game-high honors by two points over freshman Ralph Eason, who added seven steals, five rebounds and three assists to his 26 points. Mott, stymied a bit by a pretty impressive defensive performance by Lakeland on Taylor early on, led by only three at the half. At the outset of the second half, Lakeland sprinted out on an 8-1 run and actually led by six at the 14-minute mark of the half. Two other stablemates, sophomore Darryl “Boo” Marshall and freshman Jakob Perry, hit several clutch shots in crunch time to take a little wind out of Lakeland’s sails. Marshall, Mott’s point guard, finished with 14 points, four assists and only one turnover. A couple hard-earned baskets by freshman forward Kory Billups coupled with an outstanding performance by Ralph Eason on Mott’s press put the game on ice. Mott led by as many as 15 and Lakeland never got closer than six in the game’s final five minutes. For Mott head coach Steve Schmidt, tomorrow night’s game against Rhode Island CC will mark his seventh appearance in the championship finale. For Schmidt, a win would earn him his fourth national championship ring. The game will be broadcast starting at 8:30 p.m. eastern on IHigh.com. — Mott fans have come to expect great performances from Taylor and Eason. Those two guys are serious players. Not to diminish their performances tonight, but I think many people in attendance were most impressed by the poise and clutch play by “Boo” Marshall. His effort on the defensive end was tremendous and he stepped up in a big way on the offensive end, connecting on four huge triples. — I’m not basing this prediction purely on emotion, as I’ve seen Ralph Eason play 25 or more times this season: I think Eason will be one of the top 10 players to ever play at Mott by the time he’s done. He’s a ferocious competitor, and tremendous athlete and is a high-level finisher. A year from now, he is going to make some D-1 coach a happy man. — The drive for 35 ends tomorrow night. With a win, Mott will have won 35 games for only the third time in school history. The last two times the Bears have hit 35, they’ve left Danville with the title (2007, 2008). — Coach Schmidt always talk about how his program is actually more like a family. I saw evidence of that tonight, just five minutes after the team arrived back at the hotel after the game. Schmidt had his whole team gather in one room to light candles and sing Happy Birthday to one of Mott’s young fans. DANVILLE, Illinois — No. 1-ranked Mott Community College will take on Lakeland (Ohio) tonight at 9 p.m. eastern in the Final Four of the National Tournament in Danville, Illinois. Lakeland was not ranked in the top 10 in the final national poll, but they are certainly not living above their means in the Final Four. Lakeland made it to Danville by defeating two teams that had gotten the best of them earlier in the season — Columbus State and Owens. The latter is coached by Dave Clark, an assistant coach at Mott last season who helped lead the Bears to the title game. Very often game analysts will look immediately for common opponents; in the case of these two teams, there’s a precious little to be gleaned. Mott beat Owens twice while Lakeland beat them two out of three; Mott beat Oakland three times, while Lakeland defeated the Raiders in their only meeting; Mott has wins over Jackson, Schoolcraft and Delta — and so does Lakeland. The majority of their respective victories were convincing, as one would expect from championship-caliber teams. Mott’s advantage in this game is clearly on the defensive end. I don’t think you’d hear anyone argue against the statement that the Bears go harder defensively than any team in this tournament. Since the bulk of Lakeland’s scoring comes from the frontline, Mott will need big minutes out of 6-4 forward Walter Davis, 6-3 forward Kory Billups and 6-8 forward Robert Littlejohn. Those three have to limit Lakeland’s opportunities around the basket, rebound and hit their outlets. Mott’s forwards did a great job of hitting their guards to start the break against Louisburg Thursday night. There’s no team in this tournament that the Bears are afraid to run on, and I think we’ll see that tonight. To put it simply: if this game is about guards, Mott wins. Lakeland’s guards are young and will have their hands full with sophomore John Taylor. The 6-1 combo guard has scored 64 combined points in his first two games. The other poison to pick from is freshman guard Ralph Eason, a player who is far better than I think anyone imagined at the start of the season. He’s an absolute thoroughbred slashing to the basket. Mott head coach Steve Schmidt will look to increase his national tournament record to 25-4 — currently the highest winning percentage in tournament history. Click here to watch the game live starting at 9 p.m.
Mott head coach Steve Schmidt has made seven trips to the national tournament in Danville, Illinois and never once missed out on the Final Four. That incredible streak is intact after the Bears’ 72-57 win over Louisburg College Thursday night. Mott (33-1) led by 23 points midway through the second half and cruised to the victory with a dominant defensive performance. They held Louisburg to 33 percent shooting from the field and forced 21 turnovers. Only one player scored in double figures (12) for Louisburg. “When you play defense like that, you’re not going to lose very many games,” Schmidt said in a post-game interview with WDAN radio. The Bears trailed by four in the early going before putting together a run similar to one they had on Tuesday night in the opening round. 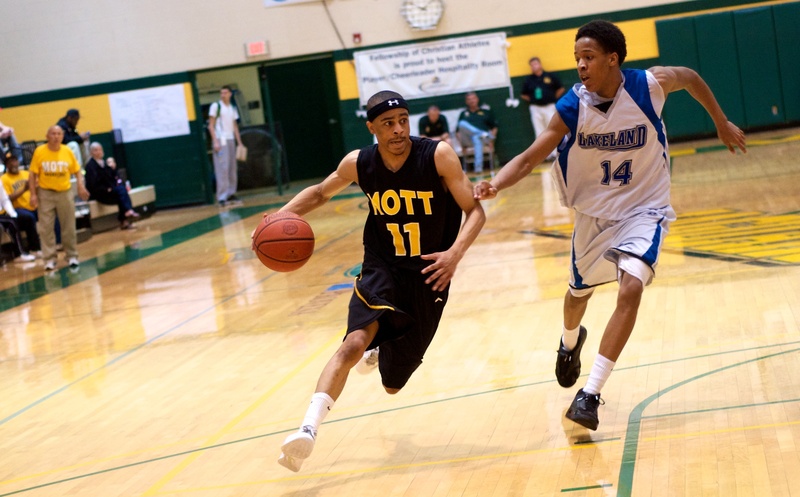 Mott scored 21 of the game’s next 25 points, led by sophomore combo guard John Taylor. With Mott’s former national player of the year Jeremie Simmons in the stands, Taylor put on a show for his Windy City brethren. He made 38 points look easy, slicing and dicing his way through a much bigger Louisburg lineup. A lot of those people live in Danville, Illinois. Through two games, Taylor has the tournament record for points with a 32-point average. Taylor wasn’t alone, however. Sophomore forward Walter Davis scored 10 points with 10 rebounds including a couple impressive dunks. Freshman Ralph Eason added 13 points with seven rebounds, five steals and three assists. Mott will play tomorrow night against the winner of the Lakeland and South Mountain game. Editor’s note: I will be leaving for Danville in the morning. Check back tomorrow for more news on Mott’s run to another title. As a freshman at Flint Beecher, Monte Morris could think his way through a basketball game better than most seniors could. 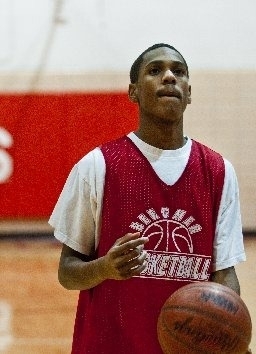 My last season covering basketball for the Flint Journal happened to coincide with Morris’ freshman season. The first time I watched him, he played so under control and intelligently that if not for his wiry frame and boyish face, I would’ve never suspected he was an underclassman. Morris had 14 points for Beecher in an early-season game against Southfield Lathrup that year, keeping the Bucs close most of the way against a team that featured current Iowa Hawkeye Roy Devyn Marble and current Wayne State player Bryan Coleman. Marble and Coleman, both wing players, were 6-foot-6. Beecher’s starting center in that game, D’Marius Houston, was generously listed at 6-foot-1. On top of the size disadvantage, Beecher also was really inexperienced. That season, they started the freshman Morris and sophomores Antuan Burks and Cortez Robinson. They only had three seniors who played significant minutes and their best player from the previous season, Javontae Hawkins (at the time considered the top basketball prospect in the Flint area in years) had transferred to Powers. All of that is a long-winded way of saying that the game really shouldn’t have been very competitive. Yet somehow, it was for most of the way, and that would become a theme of Beecher’s season. The Bucs started 0-5 that year, with close losses against experienced teams that appeared more talented. But by the time Beecher picked up its first win, beating Flint Southwestern, it was becoming more and more obvious that people should stop questioning the talent of the team. The Bucs were young, yes, but Morris very quickly established himself as one of the best players in the Flint area and one of the top prospects in the state regardless of class year. That was the beauty of watching Morris. From a young age, he instinctively knew the difference between a bad shot and a good shot. He knew how to finish in traffic. He knew how to draw contact and get to the free throw line. I don’t think I have to tell any coach or person who has worked with or watched extensive amounts of high school basketball how rare it is to find those traits in a freshman guard. The work ethic and drive was apparent in Morris during the offseason. In the state semifinals last season, Beecher was soundly defeated by Melvindale ABT, featuring a huge game from Melvindale guard and Mr. Basketball candidate Michael Talley III, who scored 34 points and single-handedly broke Beecher’s vaunted press. Most impressive about Morris, however, is that he has been committed to not only his teammates and school, but helping restore the ‘District of Champions’ tradition that Beecher was at one time known for. This is an era of high school basketball where top prospects transfer (sometimes multiple times), where people with bad intentions give kids bad advice and, without getting into specific names or circumstances that are irrelevant now, Beecher has been vultured and lost good players to those kinds of situations over the years. There is a flawed line of thinking that in order to get the exposure necessary to be a highly sought-after prospect in high school sports, athletes have to be at huge schools that churn out those types of prospects every year. The great thing about Morris is he represents just how flawed that thinking is. He’s become an elite player at Beecher for two very simple reasons, aside from his own individual talents: He is playing for a great coach in Mike Williams (maybe the best high school coach in the state, in my opinion) who pushes him to get better; and, to put it as simple as possible, Morris wins. He wins every year. What better time is there to show off things like your basketball IQ, toughness and competitiveness than the high school basketball playoffs? What better stage is there than the Breslin Center during the state semis and finals to get the chance to perform in front of college scouts and coaches? What better exposure is there for an individual player or team than perennially getting the opportunity to play for a state title? Morris, now a junior, just won his second consecutive Associated Press Class C Player of the Year Award. Tomorrow, he leads his undefeated team to the state semifinals at the Breslin Center for the third time in his three-year varsity career. Morris is a testament to the fact that overwhelming TEAM success is a great way to open doors for individual achievements as well. He’s exactly the type of player and prospect that high major college coaches interested in winning should be pursuing and he’s exactly the type of player, both for his talent and character, that the Basketball Coaches Association of Michigan should be looking to recognize when they hand out next year’s Mr. Basketball award to the best senior in the state. No. 1-ranked Mott Community College (32-1) played the most miserable 20 minutes of basketball I’ve seen in quite some time. Luckily the Bears have a hall of fame coach who knows all the right buttons to push in between the first and second acts. Steve Schmidt’s team, down nine at the half, ran over and around Danville CC to win going away, 76-59. It was sweet redemption for Schmidt, who certainly had some reservations about playing the host team in round one in front of a sellout crowd. Mott sophomore John Taylor put on a show early in the second half, hushing the crowd with a pair of deep 3-pointers to help his team wrestle away the lead just six minutes into the half. Taylor had 26 points to lead all scorers and was dubbed “Superman” by one of the courtside television analysts. From that point it was all about Mott’s trademark intensity on both ends of the floor; and, as always, that charge was led by Ralph Eason. The freshman guard was as close to perfect as any one player can be. Eason scored 21 points (10-for-10 from the floor) with five rebounds, five assists and two steals. In an interview after the game, Schmidt used Eason’s performance as evidence that these Bears aren’t a one-man team. Need more proof? The Bears, as a team, shot better than 80 percent from the floor in the second half. In all the years I’ve covered basketball, I cannot recall ever seeing a team reach that number. Mott will take on Louisburg College on Thursday night at 7:30 p.m. (eastern) in the Elite Eight.